Which gave me an idea to find a meatball-related activity for learning labs. This was one of those ideas that started small, by seeing a fun idea on Pinterest to use yarn and pom poms to make pretend spaghetti for sensory play. 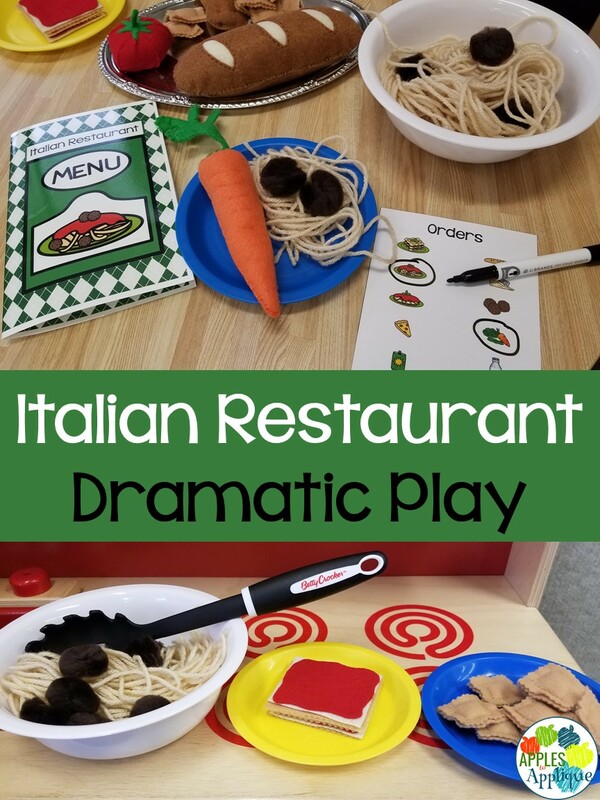 I knew this kid would love it, and the next thing I knew, I was designing an entire Italian restaurant dramatic play center. You guys know I'm pretty crafty and love making things, so I got really in to putting this all together, and even decided to make some other felt food to go along with the menu. If you're not crafty, don't worry! Any kind of play food would work fine. But I did discover that some tan felt cut with pinking shears makes some great ravioli and lasagna noodles. When it was all put together, I couldn't wait to see my student's reaction. I wasn't disappointed! All the kids loved it, but this particular student stayed at that center for the entire learning labs time. It felt great to totally make his day by customizing a center to his interests. 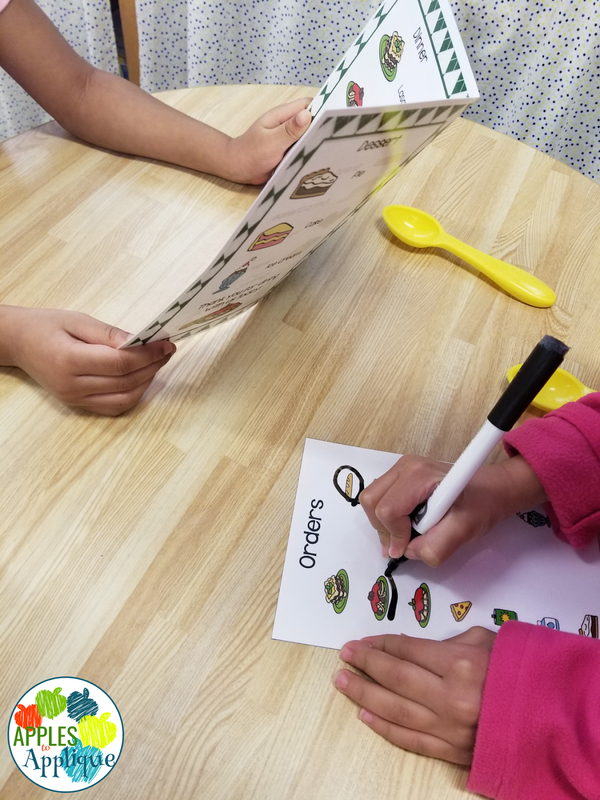 It was adorable seeing the kiddos use the menu and take orders. They got so serious about it. 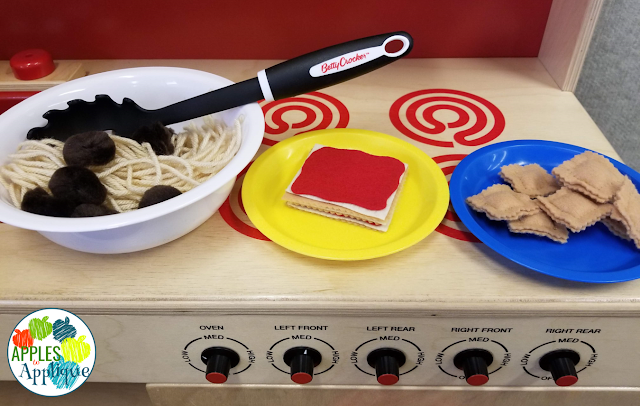 Aside from the food, all of the realia I added to this lab was purchased at the Dollar Tree, so it didn't set me back a ton, but using the real spaghetti server and dishes definitely added to the play experience! 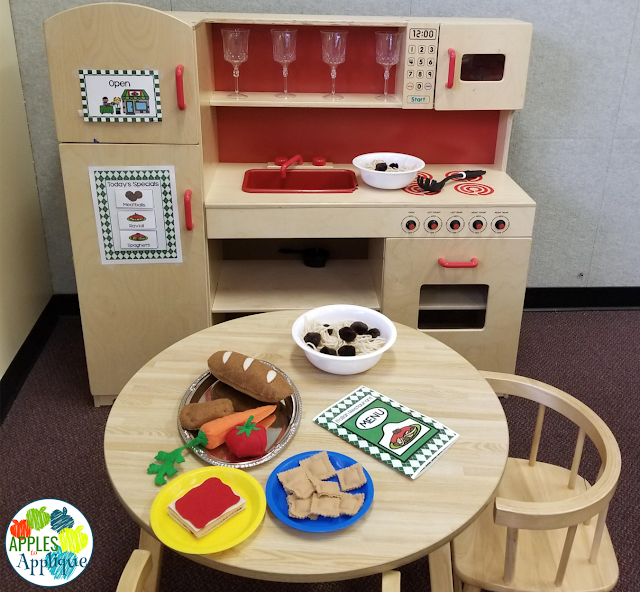 The printables for this center include a "Bistro" bunting banner, restaurant sign, open/closed signs, name tags for the various roles the kids can play (waiter, waitress, chef, and customer), menu (with and without prices to allow for differentiation), daily specials board with changeable options, order pad, and guest check. I would love to hear about how your students enjoy this Italian Restaurant Dramatic Play Center! It's nearing the end of spring break here, so, in addition to spending time with my family, I've also been working on classroom resources. 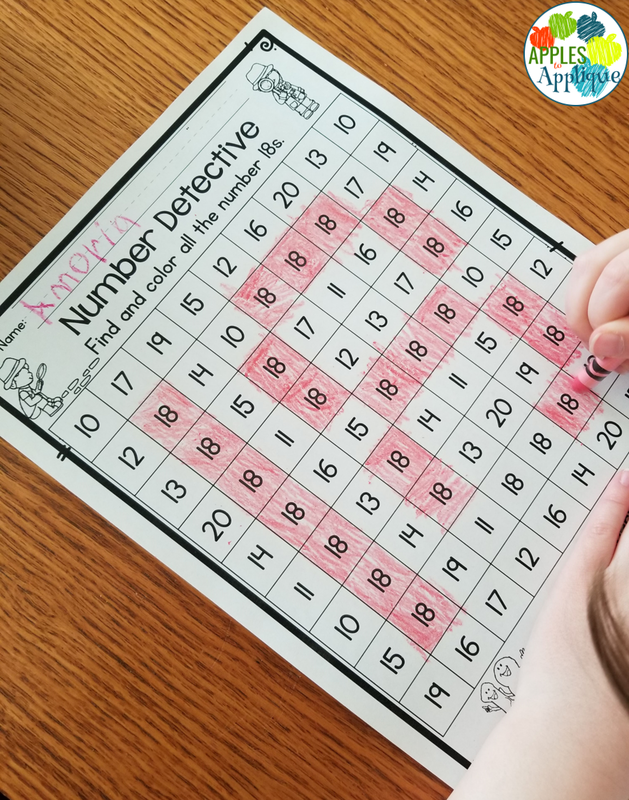 This post is short and to the point because I'm running short on time, but I had to share these new activities! I think you guys are going to love the latest addition to my TPT store: detective activities for letter and number recognition! 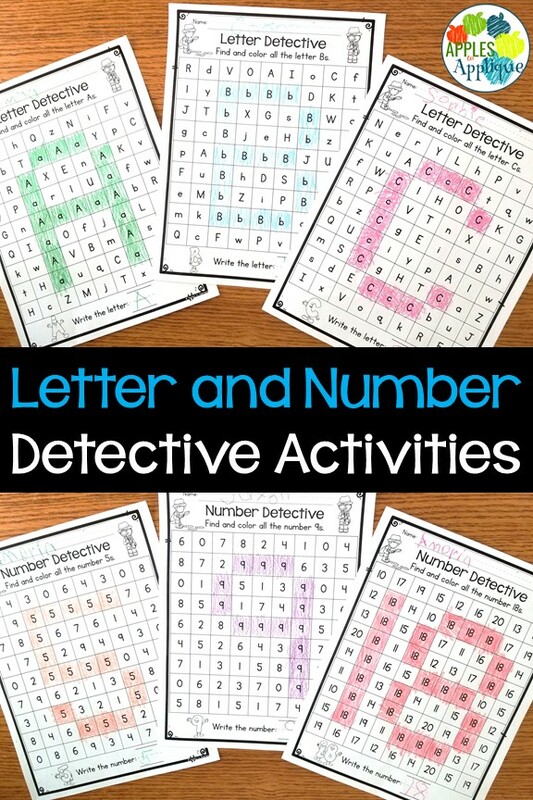 First, I have a letter detective activity that helps students learn to identify both upper and lower case letters. 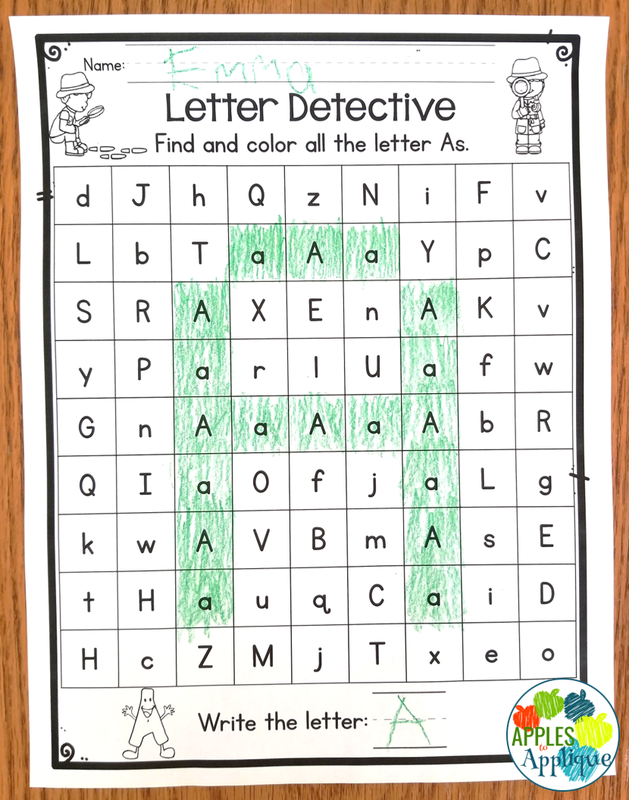 They color in all the squares with the specified letter to reveal the hidden letter. Next is the same concept, but with numbers! The number detective activity focuses on number recognition for numbers 0-20. Again, when they color in the correct squares, a hidden number is revealed. It makes checking work easy, and it's super fun for the kids. 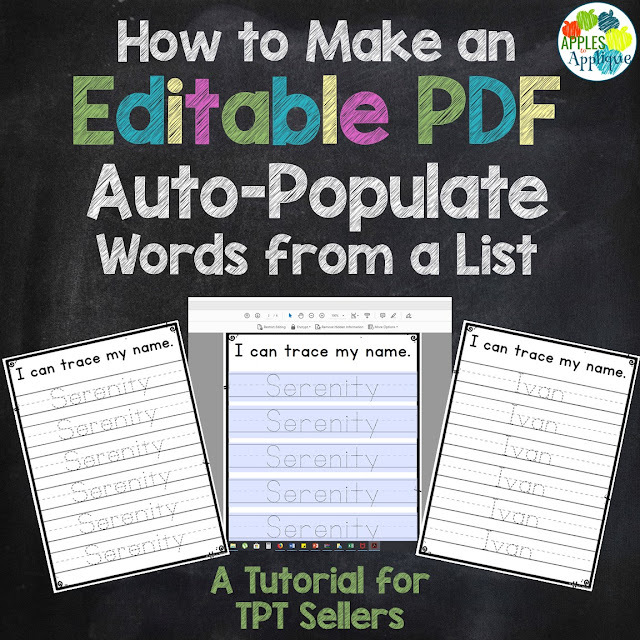 This is my first-ever how-to post for TPT sellers! I still feel like such a newbie and a small seller that I'm a little intimidated to think that I have something to offer other sellers. However, my little store is seeing growth and success, so I'm starting to realize that, while I am still small, I'm not a teeny-tiny seller any more, and that I have accumulated a lot of knowledge in my 3.5 years as a TPT seller that I can pass on. 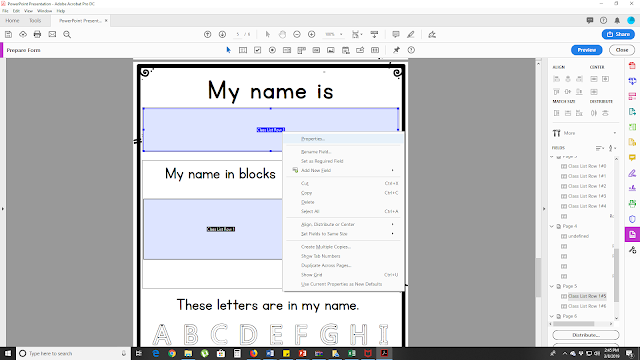 About a year and a half ago, I had seen some really cool videos of products, where a teacher could type in a list of words, and the words--such as sight words or student names--would auto-populate throughout the rest of the product, using the perfect font, sizing, etc. It looked like magic, and I could not rest until I learned how to do it! When I was trying to learn, I could not find a detailed, step-by-step guide anywhere, so I'm trying to fill that void. It took me a LOT of searching and experimenting before I figured out how to do this. I thought maybe it was just me, and that everyone else knew how to do it, but I have since helped a few other sellers with this task, so I thought maybe this post might help someone. To make an editable PDF that will auto-populate words from a list, you will need AdobePro. When you create your product, in whatever program you are using, design your pages, leaving a space where you want your editable text to be. 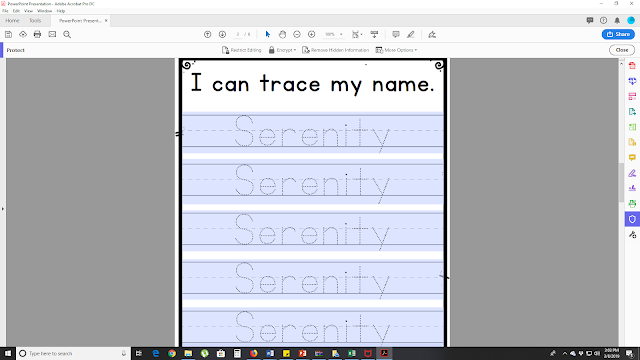 For this first page, I want the students to trace their name, so I'm just going to leave some blank handwriting lines. After I save it as a PDF, I will add the text I want them to trace. For this next page, I want it to say the student name at the top of the page, and then populate using a box font on the left-hand side, so I will leave both of those areas blank. 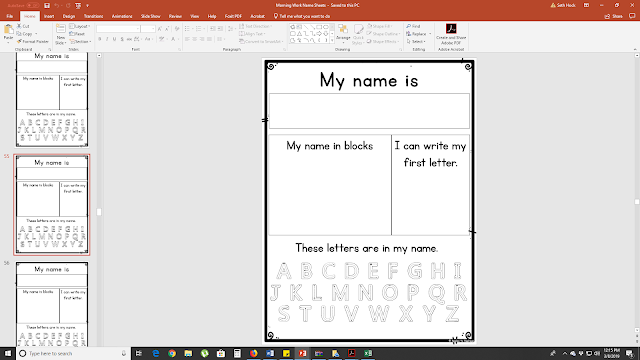 Before I save it as a PDF, I will add a page to the beginning (I usually have it right after my cover and credits pages) that has a blank table for the teacher to type their words in. 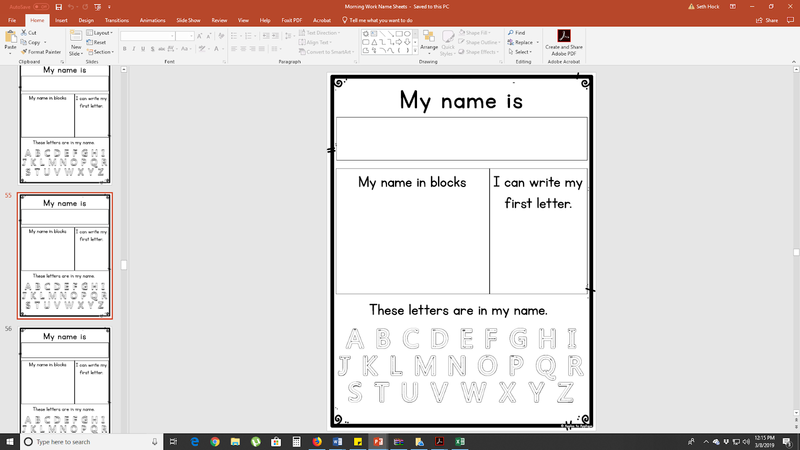 This is where they would type in the words they want to use in the rest of the document, whether those are sight words, a class list, or whatever. 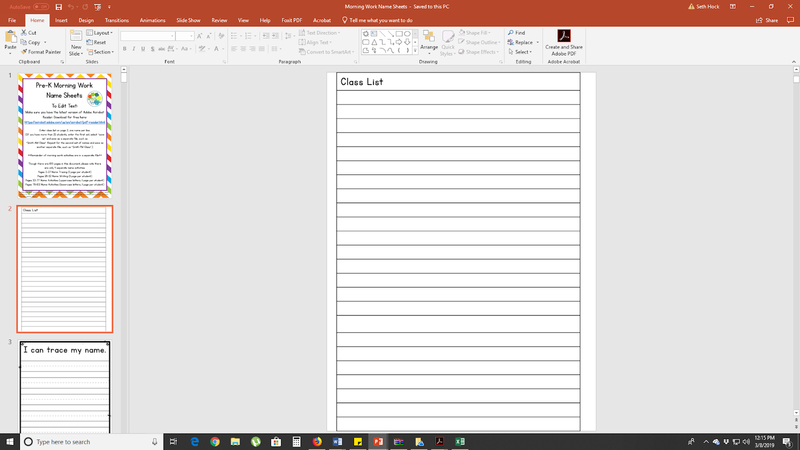 Since I am making name sheets, I called mine "class list". This page doesn't need to be fancy. 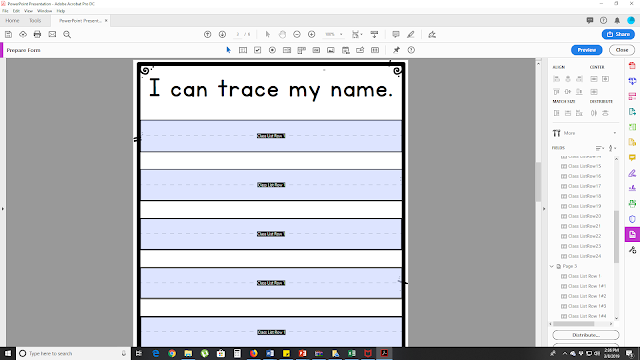 I like to use a table because it makes it easy for Adobe to see where I want to add my text boxes, without me having to manually add each one. For this particular product, I wanted a teacher to be able to create a class set of name sheets for up to 25 students, so I put 25 lines in my table. Since I want 25 copies of the same sheet, only with different kids' names, I need to start off with 25 copies of each product page I make. So I have 25 of the "My name is" sheet and 25 of the "I can trace my name" sheet. At this point, they are all exactly the same, so just design one and copy/paste to get the number you need for your product. When I have my product pages the way I want them, I save the document as a PDF and open it in Adobe. Then, I click on "Tools" --> "Prepare Form". When I do this, Adobe puts text fields all the places it thinks I will want them. They show up as blue boxes with black text in the middle. This text is the name of each field, which we will be changing shortly. These field names are where the magic happens! Look at the page where you made your blank table. Adobe will fill in the blanks on your table with text fields. Each one has a different name, just whatever Adobe thought was a good idea. On my example, they are called "Class List Row 1", "Class List Row 2", etc. You can leave this as they are, or change them to something easier for you to remember and work with. In a few minutes, you will be typing these names exactly as they appear here into other text fields in your document. 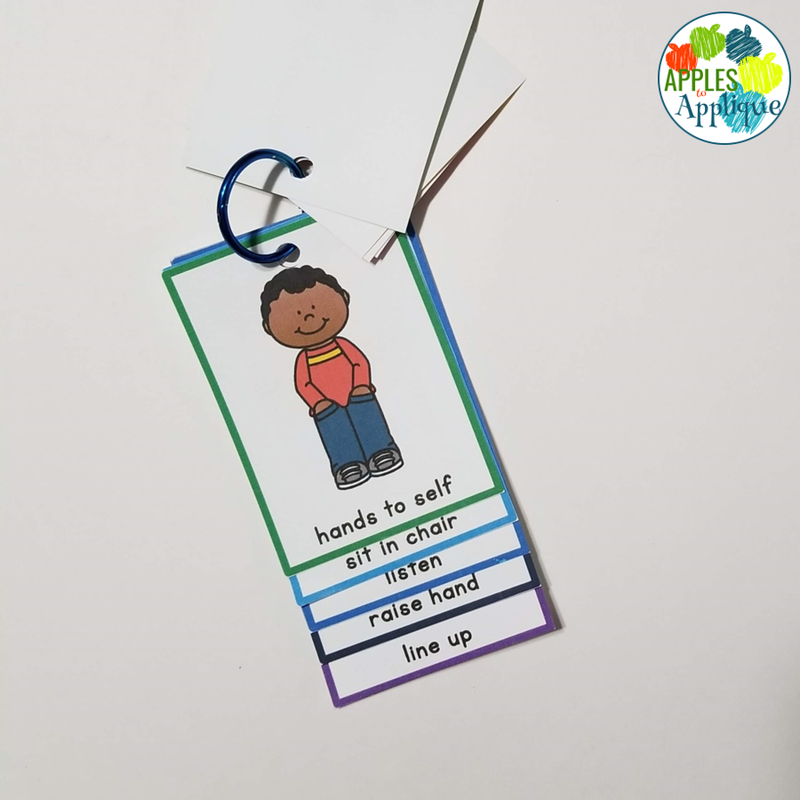 You may want to change them to something simpler, like "Student 1", "Student 2", etc., or "Sight Word 1", and so on. To do this, just right-click on the text field and select "rename field". Other times, it's way off-base, like on this page, where it tried to put the text fields between the handwriting lines. It's no big deal, just move, resize, delete, and add text boxes as you wish, until they are where you want them. At this point, the text fields all have unique names. Now that you have all the fields sized and placed where you want, it's time to start renaming them. For this product, since I put 25 rows on the Class List sheet, that turned into 25 text fields with different names. When you create a form in Adobe, every text field with the same name will auto-fill with the same text you type in, so we are going to change the names of text fields wherever we want the same words to appear throughout the document. Remember on that first page where all my rows were called "Class List Row 1", "Class List Row 2", etc.? Whatever names I used for the text fields on that page, that's what I'm going to use now on all my other pages. I will pull up the first "My name is" page. On this page, I want the student name to appear at the top and on the left-hand side, which is where I had previously put my text fields. Now, I am going to rename those text fields. I am going to call each of them "Class List Row 1". I right-click on the text field and select "rename field", then type in "Class List Row 1". I do this for each text field on the page. Then I pull up the "I can trace my name" sheet. I want the same student name to show up on every handwriting line on the page. 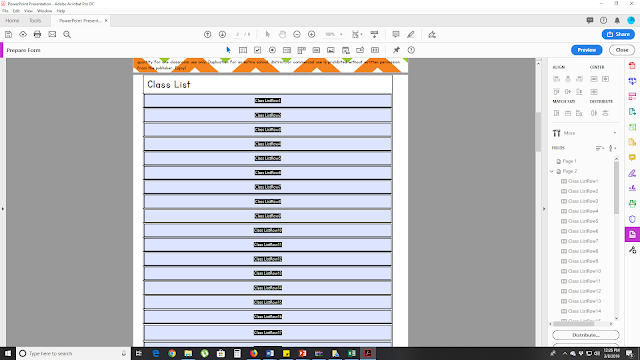 So I rename every text field on this page to "Class List Row 1". Then I will repeat this process for all of the remaining pages. 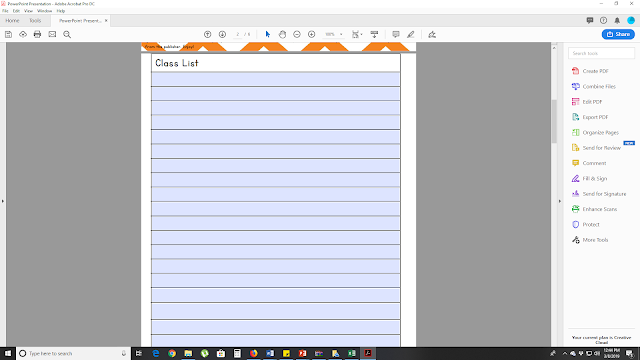 I pull up the next "My name is" sheet and change the name of every text field to "Class List Row 2". 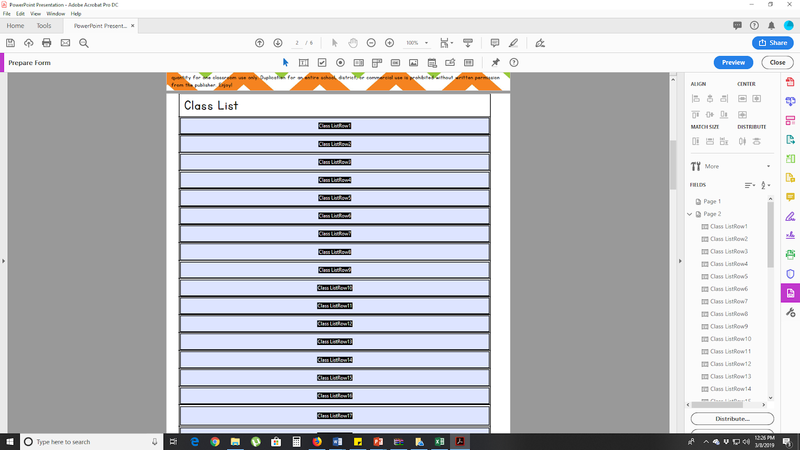 I pull up the next "I can trace my name" sheet and change the name of every text field to "Class List Row 2". This can be a tedious process when you are doing 25 pages at a time, but it saves your buyers so much time! Once everything is renamed, anything you type into any field titled "Class List Row 1" will automatically show up in every other text field that has that same title. The words in any field with the same name will always be the same. But the cool part is, they can all be formatted differently! 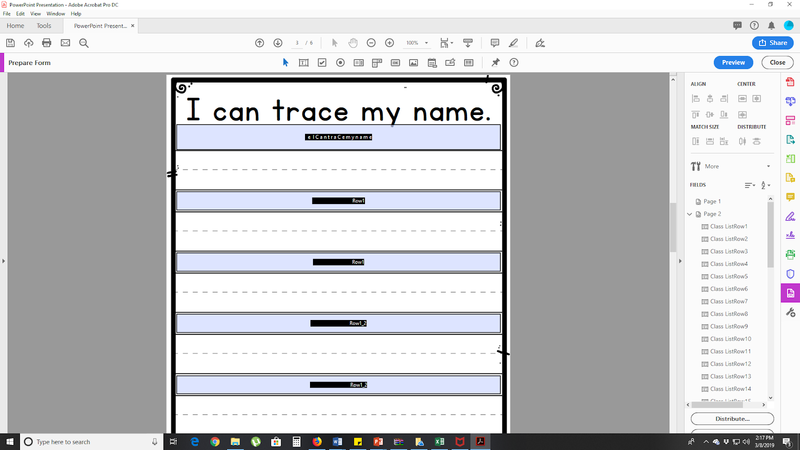 So, using my example, I want a primary printing font at the top of the "My name is" sheet, a box font for students to fill in on the left-hand side of the "My name is" sheet, and a traceable font on the "I can trace my name" sheet. Once you have decided on a font and figured out the size of font you need, go to one of your product pages (not the list page--the font on that one doesn't matter) and right-click on a text field. Select "Properties". Next, select the "Appearance" tab. There, you can select a font and size. When you embed the font in this way, whatever font and size you select is what will show up for the buyer, even if they do not have that font installed on their computer! There is a little drop-down menu for font sizes, with just a few options. If those options don't work for you, as they didn't for my product, you can click in the font size box and type in the size you need. There are other tabs you can select, as well, such as the "Options" tab, which allows you to align the text to the left, right, or center. Do this for each text field--again, it can be tedious, but the end result is awesome! This part takes some tinkering to get the exact sizing and placement right. When you are finished, you can select the little box at the bottom that says "locked" in the properties box and close the window. Don't do this until you have it exactly how you want it! Once you have changed the properties in all of your text fields, you are good to go! You can still flatten and secure your file as always, to protect your work and the work of any clip artists you might have used; just make sure the security settings you select allow for typing into form fields. When you save and reopen the file, you (and your buyer) will only see blue boxes, without any text. That name will auto-populate throughout the rest of the document, in every other text field that was named the same. And on this page, it shows up in the tracing font. All from just typing it in one time! Learning this skill was a game-changer for me and my products! I hope you found this tutorial helpful. If anything was unclear, feel free to reach out to me with questions and I'll try to help! 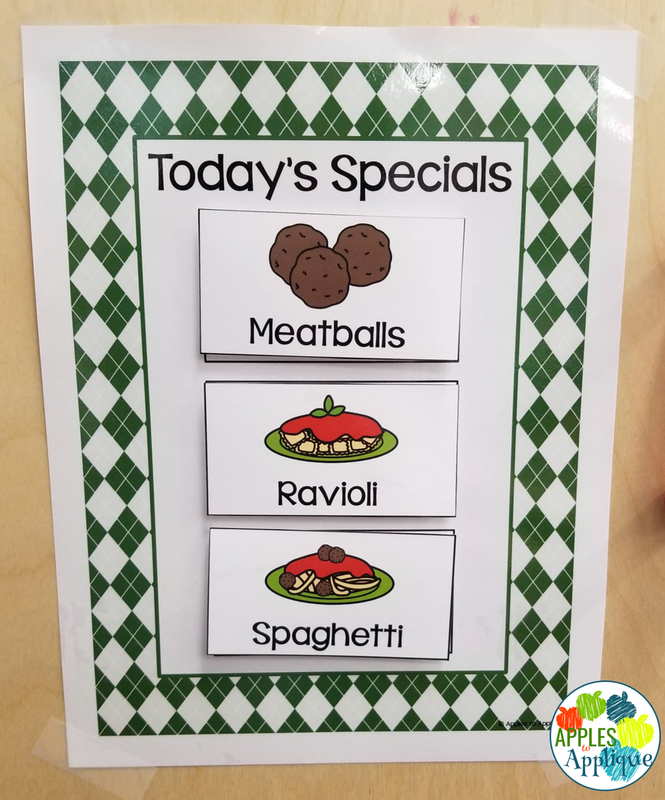 I hear often about the importance of using visuals with students with special needs. It's true that visuals provide a good way to communicate with these kiddos, as some of them do better with processing an image than the spoken word. 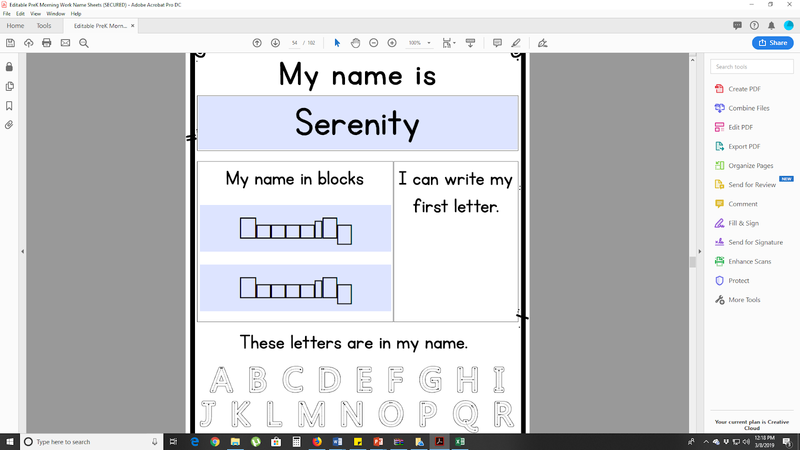 I like to take visuals one step further, and use them with all early childhood students. My classroom is made up of students with special needs, and those who are at risk, including a high number of ESOL students. I have found that all of them respond positively to visuals! Visuals provide the advantage of actually showing students your expectation. I also love that they can be used to give a direction while you are still teaching. Often, in the middle of a lesson, I will hold up a visual to a student who is off-task, while not missing a beat with my instruction. This is why I LOVE the quick-reference design of these visuals in my Teachers Pay Teachers store! Another powerful thing about visuals is that they lead to fewer power struggles and defiant behaviors. Students don't feel as challenged when presented with a visual as they do with a verbal command. They don't feel as much like they were called out in front of their peers; in fact, often times their classmates don't even notice the direction has been given, since the teacher is able to continue seamlessly with instruction. 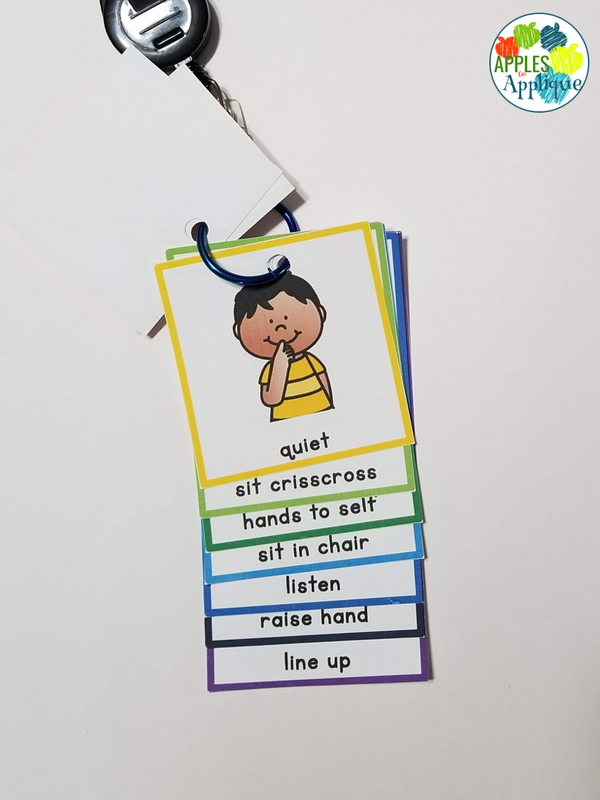 While this doesn't hold true 100% of the time, and of course some students will still choose to not listen, I have found that, by and large, a child who is calmly shown a visual to "sit" or "be quiet" will respond better to it than being told verbally to "sit" or "be quiet". I attach these visuals to my lanyard so that they are always ready to go. When needed, I usually hold up the visual and give it a tap, then when the student complies I give a quick smile and a thumbs-up. We have an entire exchange without any words, and without them feeling embarrassed in front of their classmates. It's quick, easy, and effective. 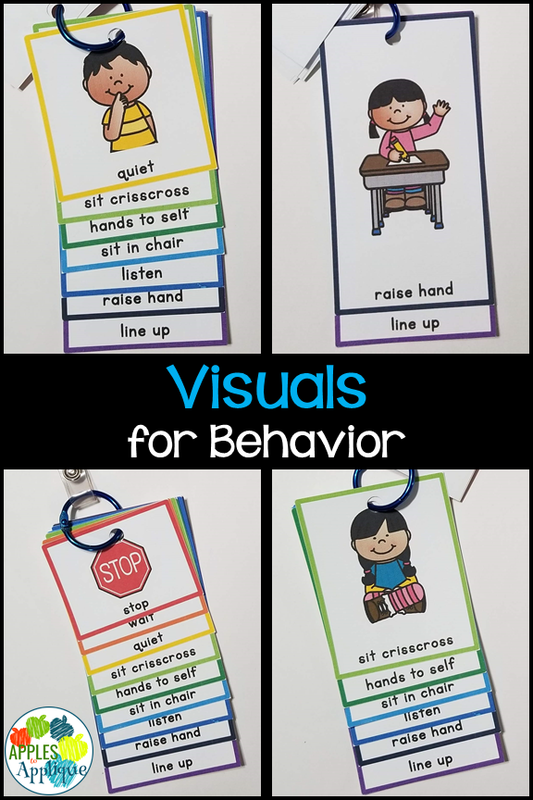 If you have any experience with using visuals for behavior expectations in your classroom, I would love to hear about it! Drop me a comment below! I am always on the lookout for ways to increase the rigor in my Pre-K classroom. I have found time and again that my little learners are capable of so much more than people realize. They can understand more than people give them credit for, and I love expanding their minds with new knowledge. I found this anonymous quote that says, "A mind when stretched by a new idea never regains its original dimensions". That is powerful! I want to help my students expand their minds as much as possible early in life, to give them more capacity for learning in their future. 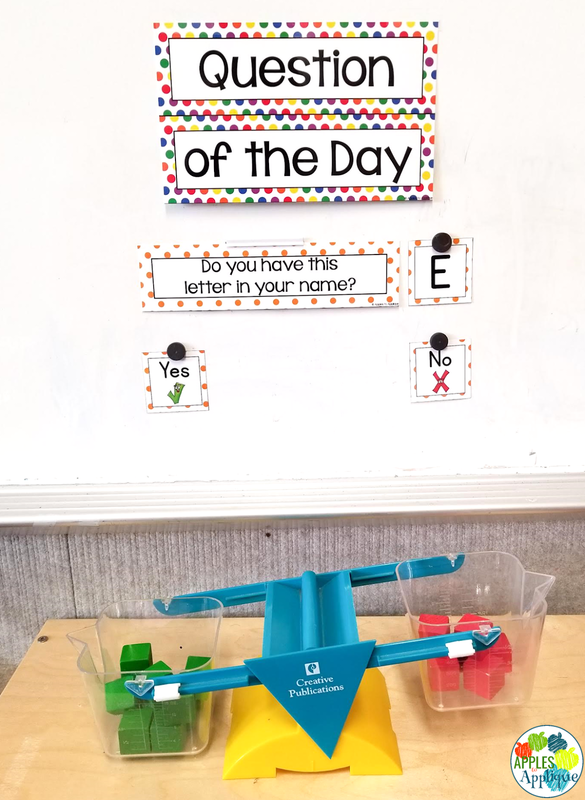 One easy way I do this in my classroom is through the use of a question of the day. On the surface, it sounds simple enough. I post a question on the board, and the students vote on their answer. But it encompasses so much more than that! Of course they cannot yet read it independently, so I read it to them while pointing to each word. This provides good exposure to print, and helps them learn basic print awareness skills, like reading from left to right, the fact that print represents spoken words, and that letters are grouped to form words. All of that, just from reading to them, and we haven't even gotten to answering the question yet! Next, they get to think about answering the question. I give them questions that relate to things we are learning in the classroom, activating some prior knowledge first thing in the door, or questions that focus on skills they need to practice, such as letter recognition. I strive to use questions that do not have a set right or wrong answer, or at least, not the same right or wrong answer for every student. For example, we are currently in a unit about plants and gardening. I avoid questions like, "Which of these is one of the needs of a plant? Sun or rocks?" The reason I avoid these types of questions is that once a few kids answer, the rest of them will not stop to process the actual question. They will simply see where everyone else has put their counter, and follow suit. Another way I use the Question of the Day to increase rigor is by changing the method by which the students vote. Early in the year, when they are still working on name recognition, I have magnets with each of their names on them. They have to locate their name, and then use their magnet to vote. Later in the year, when they have mastered recognizing their own names, I switch it up. I have them vote by placing a cube in a balance, and we talk about how we know which side has more. My mathematician stacks the cubes to count the votes and we compare to see which tower is taller or shorter. Currently I am having them vote by placing magnetic counters on a ten-frame. This gives them real-life practice with using a ten-frame; I watch as they vote to make sure they start in the top left corner, and fill in each space in order. 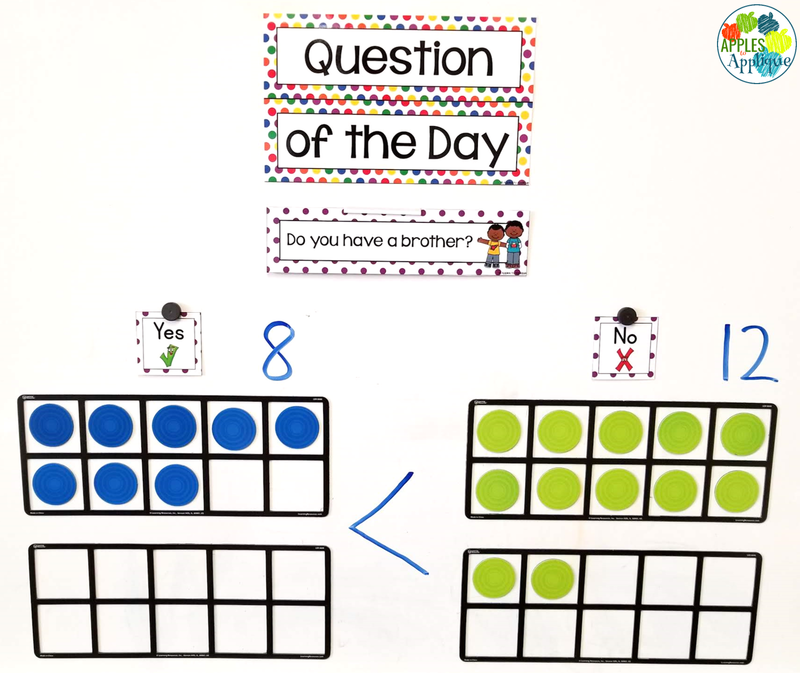 When the class mathematician counts up the votes, we talk about strategies for subitizing using a ten-frame; i.e., "I see the whole top row of the ten-frame is full. How many is that?" "Can we count on from five to see how many we have all together?" "Wow, I love how Nyla subitized! She saw the ten-frame was full, so she knew ten friends voted for roses without having to count each one by itself". To increase the rigor even further, we then talk about the concepts of greater than, less than, and equal. One of our Pre-K standards is comparing quantities, and once they have that down, I take it one step further by introducing the greater than and less than signs. This part is obviously not a Pre-K standard, so we don't spend a lot of time on it, but now my kids have been exposed to it and know how it works (yay for the good ol' "alligator mouth" analogy!). 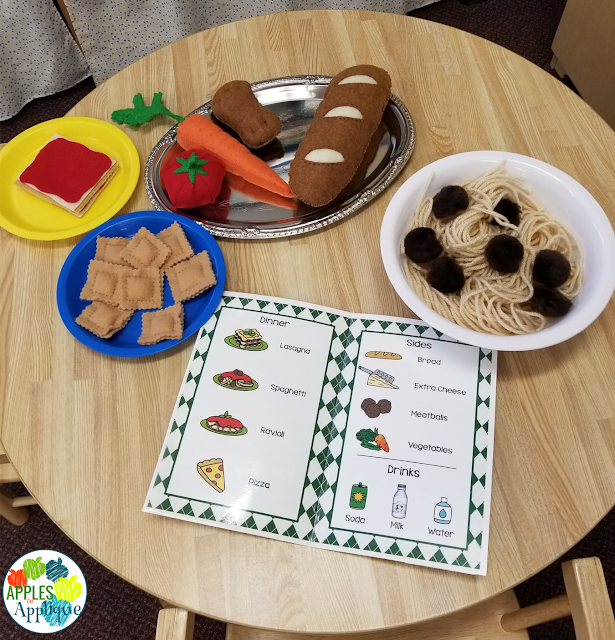 When they are introduced to these math symbols again a little later in their education, they will have some prior knowledge to access from their time in Pre-K, and be ready for greater challenges! One of the most difficult things for me was coming up with a fresh new question every day. I finally took the time to compile a giant master list, and made a Question of the Day kit with more than enough questions to get through the entire school year. I even color-coded it, so it's super quick and easy to implement. Find it here! 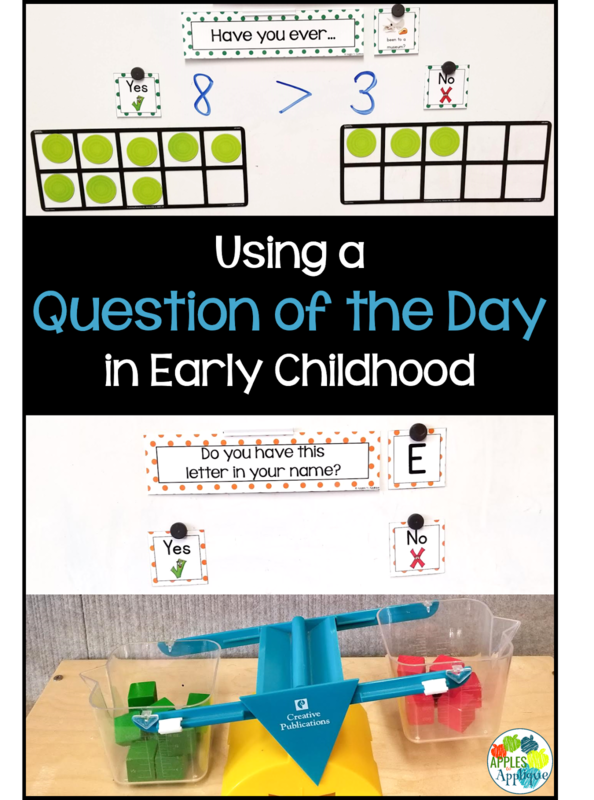 Have you used a question of the day in your early childhood classroom? I would love to hear how it works for you!